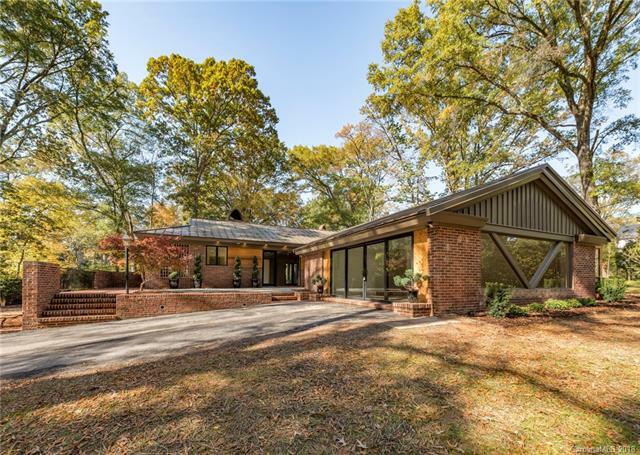 Iconic Mid Century Modern estate situated on 1.6 acres in Plaza-Midwood, originally designed by local modernist architect Charles Connelly, thoughtfully redesigned by R. Andrew Woodruff and meticulously executed by Peter Vasseur. Completely renovated yet many original details were preserved. Expanded kitchen opens to large living area ideal for scaled entertaining, fireplaces in den, living and master bedroom, generous sized family room with screened porch adjoining, playroom with signature picture window, private courtyard just off the Spa inspired master bathroom. Landscape design created with potential garage and pool. Contractor has estimates for each. Garage renderings are in the media attached.